As fantastic a spin Shaft and director Akiyuki Shinbô can put on the sheer artistry of animation, their shows have had the plot of a manga to follow. No matter how creative and exotic the style of the show may be, there was always knowledge of the general direction. Twists in plot and in-jokes would be seen coming from a general distance, even if it was lovely to watch. I'm hardly saying this is a downfall or criticism of the Shinbô/Shaft paradigm. I'm merely indicating that there's a pattern to the madness. If you followed the manga to a T, you had an inkling of what to expect. Perhaps that is part of the success we saw in Evangelion; without an end to pursue, the means has weight. This idea of the "blind finish-line"—that split second before someone charges through a door without knowing if there would be a wall or salvation—is giving their current series Puella Magi Madoka Magica some hefty expectations. 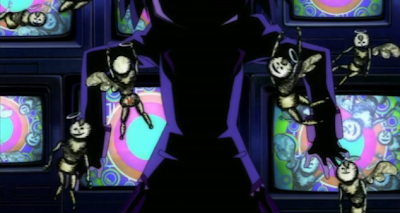 However, that lack of a clear-cut denouement is making the series so much more palatable. To say that the spirit of the show is different in the second three episodes than the first is an understatement. The initial excitement that Madoka and Sayaka had about discovering the "magical girls" has faded (for obvious reasons), as the tone of the series has taken a much darker turn. However, while Madoka continues to be afraid of the responsibilities of being a magical girl, Sayaka seizes the moment—when Madoka finds herself tormented by a witch, she is rescued by Sayaka, who has used her wish to help the injured Kyôsuke play the violin again. The sudden chaos surrounding territory becomes the focal point of this miniature arc. 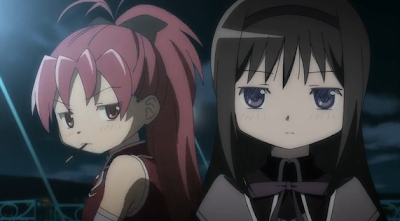 While Homura continues to warn the others about the dangerous role of the magical girl, and Madoka still requires cryptic advice from her career-striving mother, Sayaka's new position brings both relief to her relationship with Kyôsuke and a new challenge for her survival in the form of a new magical girl who wants the turf. 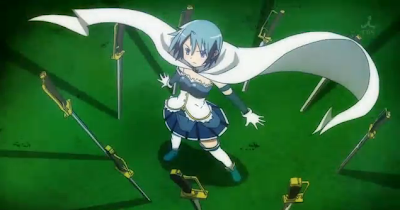 Kyôko Sakura, voiced appropriately by a sassy Ai Nonaka (Kafuka, Sayonara Zetsubô-sensei), challenges Sayaka for the spot left by Mami. The resulting battle between Kyôko and Sayaka is one that never finishes and never starts a second time. During a lapse of judgment when Madoka tries to separate Sayaka from her Soul Gem, the group is shocked to learn that the Soul Gem is a source of life for magical girls—being 100 meters away from it leaves Sayaka prone and lifeless. The curve ball thrown by Shinbô and Shaft is reflected not only in the drastic change in tone that the series takes, but primarily in the sudden use of plot to drive the story. The use of cut-out animation is still fascinating yet suppressed, as the studio uses more background art to strike visual awe. However, there is a lot more focus on the tension between the magical girls and the uncertainty reflected in Madoka's character. While the other girls debate the role of the magical girl through conflict, Madoka is caught between her mother's reason and Kyubey's candy-like offerings of wishes. Actually, it's quite surprising to find that Madoka is the last to consider becoming a magical girl, the one thing I wasn't expecting from this story. 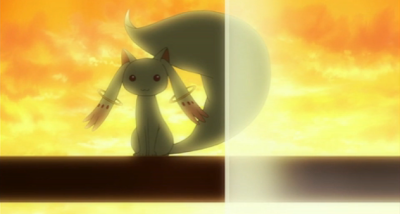 Unlike many shows that thrust the role of the magical girl onto the main character, the consequences are presented to Madoka for her to make her decision. While her choice is likely fated, wouldn't it be a sultry smack-in-the-face to fandom if the title character of a magical-girl series...never becomes a magical girl at all? 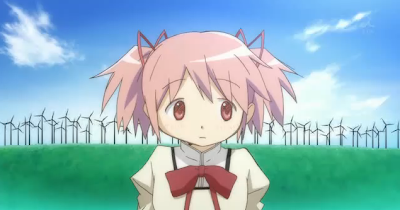 Madoka Magica is a terrific show to follow, but a torturous show to second-guess. With so many traps laid by witches and catches untold by Kyubey, it's hard to tell just who is the villain so far: the moppet who seemingly means well or the actual runic witches driving people to despair. If the show continues a magnetic pull on darkness, the similarities in character design between Madoka Magica and Hidamari Sketch will be trivial, and the show will distance itself from other magical-girl tropes. With the show just about half-over, one can only wish for more.